When I first moved to Hackney five years ago, one of the first things I did was to look up a community gardening project so that I could keep a connection to flowers and plants and the changing seasons. I found the delightful St Mary's Secret Garden and have been volunteering there ever since. Sometimes, I ask if I can take some flowers home to paint. 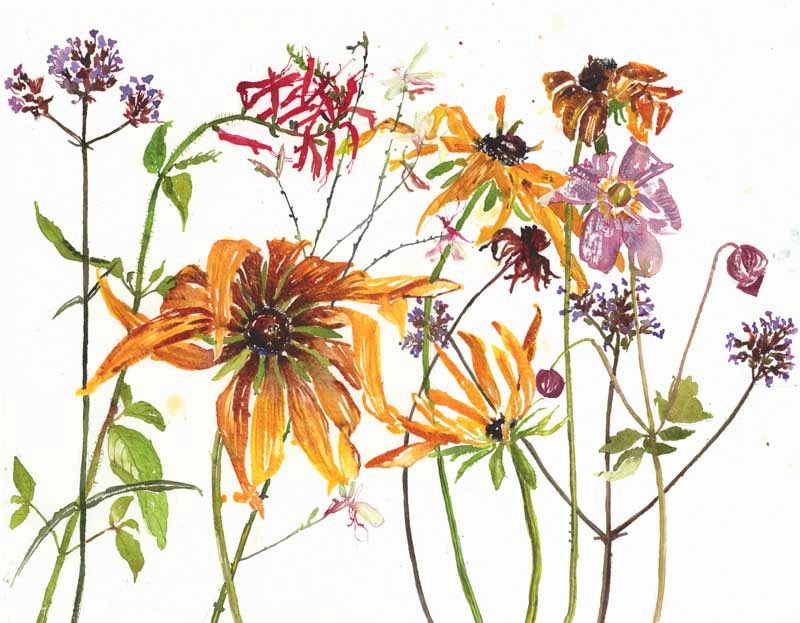 These ones almost painted themselves onto the page, I was so inspired by the mad flaming floppiness of the Rudbeckias and the general late autumn messiness of everything. Flowers from a florist are just not the same. Besides the flowers, I get so much out of volunteering at St Mary's, where I work with adults with learning difficulties and mental health issues. Last week I planted onions with G, who suffers from debilitating bouts of depression in between stretches of great joviality. It took us two hours and we planted three rows, but it isn't all about hurrying to get things done in horticultural therapy. The white fly settling like teeny snowflakes on the cabbages, the soil cold and wintry, bursts of exuberant song courtesy of P, a client with a great love of dancing with his rake rather than actually gathering up leaves, and G taking great care with each tiny onion - we had a good time out in the garden. Much as I love to be painting in my studio, I treasure my day at St Mary's. Lovely and very autumnal! And what a beautiful volunteer experience.